The Silver Bullet boys are riding in at high noon, and no one else is left in town to take them out. Click here to play! Last night, you were just a deputy. This morning, the sheriff was nowhere to be found, and you looked down to find his badge pinned to your chest. You think you know someone. Turns out you can never truly tell the measure of a man until he's looking down a barrel with the Grim Reaper staring at him on the other side. Turns out the sheriff was a jerk. The Silver Bullet slots see you back in the Old West, where a steady hand and a keen eye was the greatest asset someone with ambitions to stay alive could possess. Just as it was back then, a revolver or two help matters along no end, as scatter symbols that will pay out big on total bets. The real money is in oil, though, and barrels of it are the way to undreamed of riches, with a 5 barrel payline paying out 10,000 times the line bet. If you hit an oil field that pays off that well, you'd best watch out for those Silver Bullet boys, else you could end up penniless and perforated rather than living large in Chicago. It's not too long until those Silver Bullet boys ride in. Get on over to the Silver Bullet slots to build up a fortune, maybe enough to convince a few hired guns to make the Silver Bullet boys disappear. A revolver symbol is the scatter symbol. When 2 or more are on screen, a payment equal to a multiple of the total bet is added to the payline win. 2 symbols win an amount equal to the total bet. 3 win 5 times the bet. 4 win 10 times the bet. 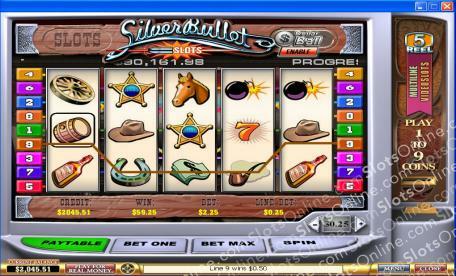 5 revolver symbols onscreen win 100 times the total bet. The sheriffs badges symbols is wild, and may substitute for anything other than a scatter symbol.